Successful Seminar in Minnesota – Thanks to All Our Supporters! Thanks to M-Theory Martial Arts and The Academy! Saturday June 10th marked the first fundraiser with IJEF-affiliated academies M-Theory Martial Arts and The Academy. These two schools helped The International Jiu-Jitsu Education Fund raise over $1900 for the IJEF mission!!! As our staff is works on an entirely volunteer basis, 100% of these funds will go to helping spread jiu-jitsu practice to underprivileged communities in Ecuador, Chile, Guatemala, Brazil, Los Angeles, and elsewhere around the world! According the fundraiser’s organizer, Professor Ishmael Bentley, over 60 students attended the two-part seminar, which began at The Academy in the morning and finished at M-Theory in the afternoon. Among the attendees were a total of NINE black belts — amazing to have so much jiu-jitsu knowledge concentrated in one place! The morning began with accomplished martial artist Renan Vital showing some judo moves and guard passes. Then Professor Ishmael showed some guard passes, followed by Professor Greg demonstrating some escapes from side control. Then in the afternoon, Professor Greg showed a number of further guard passes and Professor Ishmael instructing the group in some attacks from the closed guard. Thanks again to everyone who came out to this event and donated to the IJEF mission! We absolutely could not do what we do without the generous support of so many dedicated jiu-jitsu practitioners helping us Roll Toward a Better World! Calling all BJJers in the Minneapolis area! Here at The International Jiu-Jitsu Education Fund, we’re honored to have the support of martial artists and Brazilian Jiu-Jitsu academies across the world. 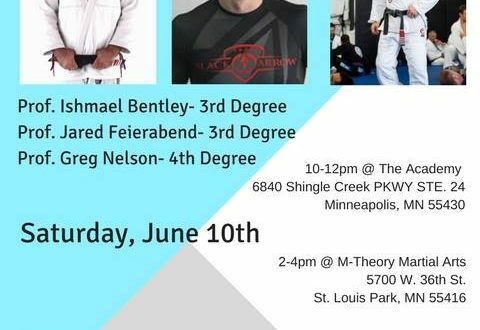 One of our most committed supporting academies — M-Theory Martial Arts in Minneapolis, Minnesota — is showing their support for IJEF this weekend with an amazing black belt seminar and fundraiser THIS SATURDAY June 10 starting at 10 AM! M-Theory’s head instructor, 3rd degree black belt Professor Ishmael Bentley will be joined by Professors Jared Feierabend and Greg Nelson, who are generously donating their time for a two-part seminar! Three black belts, two separate seminars — what more could a jiu-jitsu lover ask for? The day will kick off at Professor Nelson’s school, The Academy, from 10 AM to 12 PM. After a quick lunch and buzz over to Professor Bentley’s academy, the jiu-jitsu will continue! 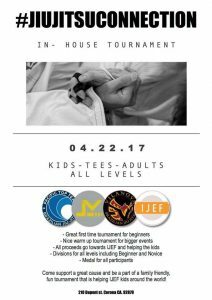 We hope to see a big turnout to benefit our efforts to bring free jiu-jitsu to children across the world. And best of all, the ultra-talented black belts Renan and Rubens Vital will be on the mat taking on any and all challengers — hope to see you there! Congratulations to Coach Bryan Tamayo, Pacific Top Team Ecuador and Team Viejo Luchador! They hosted the first ever IJEF Ecuador Kids Tournament! We also want to congratulation all of the kids on an outstanding job! Coach Bryan and his staff in Porto Viejo, Ecuador have been running the IJEF project there for almost a year now and have almost 50 students consistently practicing in the IJEF kids classes. Coach Bryan started by advertising in the local slum which is on an adjacent hill facing his academy. He advertised to parents of children who had no activity to do and who had no money to afford activities for their children. The slum that they are a part of is called, San Pablo and is notorious for poverty and violence. Coach Bryan brought these children in with the support of the International Jiu Jitsu Education Fund sponsorship and now these children are training and have uniforms and hope. This tournament is a testament to their hard work and that of Coach Bryan and his staff. Congratulations everyone on your hard work! IJEF Ecuador Enrollment Reaches 40! Wow! Coach Bryan Tamayo of the Ecuador Project has already increased his enrollment from 15 to 40 kids in just a few short weeks! What a dedicated Roll Model. Bryan’s work really illustrates the community-building power of jiu-jitsu. When these kids are “on the mat” — a revered and special place for a martial artist — they are expected to practice mutual respect and to work as a team to make everyone better. They learn to love others’ success as much as they love their own. And these principles pay off — just look how much fun they’re having in this image, courtesy of Coach Bryan! Our focus is now to get each of these kids a personal uniform, known as a gi, as soon as possible. Donate to make this mission happen. Just $20 will buy and deliver a gi to one of these awesome kids! Another day, another exciting update from IJEF, the International Jiu-Jitsu Education Fund. Today we’re happy to report Coach Oswaldo of Xela, Guatemala added his 28th student to the roster! Coach Oswaldo began his instruction with just twelve students, training on a dirt floor in gym shorts. When we came to visit, he had around 20 students. We’re glad we brought some extra uniformss, since his school only continues to grow! In fact, the image for this post was Coach Oswaldo’s academy as of August — from 14 to 28 students in just over a month. Incredible work! With any luck, Coach Oswaldo will need some more uniforms soon. Help him out by making a donation — just $20 covers the cost to get a brand new kids uniform to his academy! Thanks to the Schiller Charitable Foundation! Charities are nothing without the many dedicated individuals offering their time, money, and effort in pursuit of a larger good for the world. Without our incredible allies and advocates around the world, IJEF would be a few folks with some gis and good ideas, but nothing to show for it. Today we’d like to thank one of those generous supporters that makes our work possible: James Carter and the Schiller Charitable Foundation. I have been a jiu-jitsu practitioner for nearly six years and have yet to see a single person negatively affected by its teachings. Jiu-jitsu is a positive and empowering art that transcends age, gender, and physical ability. The only thing that has been missing, for a large part of the world’s population, is access. Until now. Through their efforts, IJEF and its international instructors are profoundly changing the lives of kids around the globe by introducing to them the opportunity to explore jiu-jitsu practice. In an uncertain world, I have no doubt that the future benefits to these children and communities will be multi-generational and deeply meaningful. The International Jiu-Jitsu Education Fund is a charity determined to bring our beloved martial art to children across the globe. 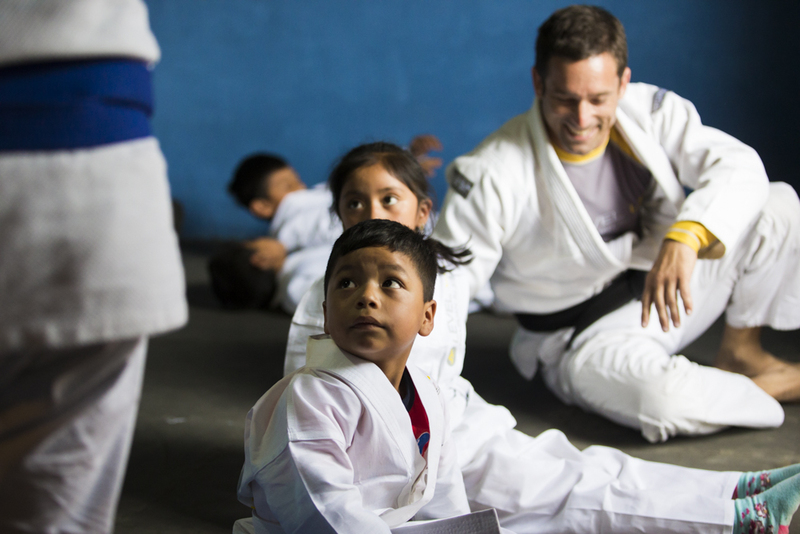 From Brazilian shantytowns to the neighborhoods of Los Angeles, IJEF operates under a simple ethos: the more kids learning jiu-jitsu today, the better off the world is tomorrow. That’s because we know that jiu-jitsu represents more than a martial art. It’s respect, discipline, and family. IJEF originated with the most elemental relationship in all of jiu-jitsu practice: professor and student. The professor was Erik Klinger, 2nd degree black belt and instructor for over 25 years. The student was a recent immigrant to the United States, just 18 at the time. For five years the professor taught the discipline of jiu-jitsu to the student. Like many young martial artists who have felt the pull of jiu-jitsu, he seemed to be at the academy more than he was away from it, training more often than not. He often helped instruct kids’ classes, constantly learning and improving until he was teaching on his own. But when he eventually made the difficult decision to return to his home country to be with family, he was a coach and student no longer. Years passed. The relationship simmered until the day Erik received a call from his long-time student. A young child listens to Coach Oswaldo’s instructions in Xela, Guatemala. “Have you been training?” the professor asked. “There is no jiu-jitsu here, professor. There is nobody teaching,” replied the student. And there it was: an opportunity to spread jiu-jitsu to a place where it hadn’t been before. And so, IJEF was born. This modest beginning– a bond between student and professor– has grown into an international non-profit with instructors in four different countries and counting. The efforts of these dedicated individuals have brought scores of newcomers into the jiu-jitsu community. Children are learning. Lives are changing. And with the help of so many generous believers in the power of jiu-jitsu, the movement continues to flourish.